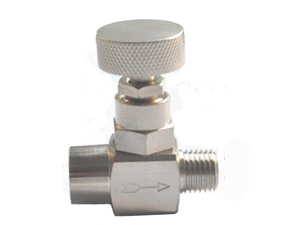 Instrument Parts Pressure Gauge Accessories Brass Needle Valve Nickel Plated. This sturdy brass needle valve, with teflon packing glandss, Rated to 600PSI @ 300°F,he large round knurled handle offers maximum ease and precise control to throttle the pressure on & off to the gauge. CAUTION: A coil syphon should be used between needle valve and steam service.